The problem with being a science fiction writer is that those darn scientists keep leap-frogging ahead of us, discovering actual cool stuff that’s even more amazing than what we dream up. You know what they say about truth being stranger than fiction (because fiction is restrained to the plausible, while truth doesn’t care if you can believe it or not). Apparently, there are rings of anti-protons circling Earth (that we’ve just now discovered). Anti-protons are the anti-matter of protons. In case you didn’t already know, anti-matter does exist and has been produced at the CERN laboratory by colliding high speed particles to produce all kinds of strangeness. In theory, anti-matter collisions with matter can produce large amounts of energy (also radiation) that could be used to power spaceships. In fact, anti-matter engines are a staple of science fiction (I put one in my middle grade SF novel, Clone Runners). But in practice, it is difficult to isolate anti-matter and even harder to generate it in sufficient quantities to power a light-bulb, much less a space craft. Sure, there may be some technical difficulties to that. Like how do you harvest something that self-destructs and unleashes vast amounts of deadly radiation whenever it touches real matter? (This might help.) And how do you build a spaceship with anti-matter engines without frying all the passengers with radiation and also without radiation shielding that weighs more than a small black hole? But for SF writers? We just got a cool new refueling idea for all those interplanetary expeditions. Until Reality one-ups us again. Wow that's amazing!! 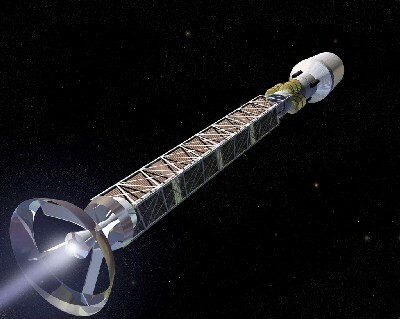 I've been looking for some sort of 'fuel' to use in my novel for interstellar space travel and that's an awesome idea! Not to mention extremely exciting for scientists (and for me)! And I totally agree with you, how science keeps catching up with all the cool stuff we can imagine, but that just makes ideas for the future even cooler and more exciting!! Awesome post! That's great news! I hope they can find a good way to harness it. That's really cool. It's neat how many artists can picture the future and then we sit back and watch reality catch up to the artist's vision. Like the communicators in Star Trek. Touching a badge on your chest and talking to someone orbiting a planet seemed so far-fetched back in the '60s, but now we have cellular, satellite, and Bluetooth communications and Star Trek seems dated in some realms. I always find it so weird and astounding when either something from a sci-fi book comes true or when I read about a new piece of technology that really (in my head) belongs in a book or movie. It's amazing how quickly technology is progressing. Interesting… my current piece is SF w/ lots of interstellar travel,though as of yet, I have left the traveling fuel ambiguous. I love your geeky passion for science fiction, Sue. 🙂 Thanks for informing us about the new scientific findings! I was reading some 1970's sci-fi stories by Harlan Ellison and chuckled at some of the computer descriptions. Tubes? Have you heard about that "elevator" idea–lifting items from earth into space, instead of using rocketry? If you're writing "blast off" in your book today, by the time it's printed that may be old science. hi miss susan! i love science. this is way cool stuff for sure. i wish i could jump in time and see whats gonna be in space travel way in the future. for sure its hard being a sci fi writer cause for real science keeps catchin up and maybe even passing you by. My hubby, who reads physics books for a hobby, keeps me up to date on what's happening in science. (technical advisor) I also receive the NASA newsletter about new developments in space & science. I keep articles from the (real) newspaper as well, that might be usable in my science fiction novels. If science has found the fuel, can planetary and star travel follow? It's an exciting time when science takes a leap ahead. You win forever for quoting Sheldon. Forever. This is incredible and fascinating. Maybe it's just me, but these last few days have been full of science wonders. It's the third time my mind gets blown, and I Love It. Science is amazing, isn't it? My current WIP is a scifi set in 1908 and loosely based on some weird stuff Tesla did. Every time I thought I was going too far out on the branches of the crazy tree, my engineer husband said, "Well, actually, there's some physics research that supports what you wrote …"
Thank heavens physics is weird! How cool is that?! Now someone just needs to create a spaceship that can harvest all that antimatter on its own, some sort of vacuum attachment that only attracts floating antimatter! Though scientists are certainly discovering new things right now, I worry about the future of space exploration and findings with the recent cuts to NASA, the NSF, and other key research funding agencies. It's a very volatile time to be a research scientist :(. Still, interesting news. I would rather dream of an anti-matter cluster than deal with the harsh realities of human politics anyway. Cheers! Oh Rex. I just weep for the loss of the US manned space program. I mean, really? Now, even the ESA is beating us in at least trying to come up with a plan for defeating those future Earth destroying asteroids. We're leaving it to Space X.
I would rather dream of an anti-matter cluster than deal with the harsh realities of human politics anyway.